I’m jumping out of my seat as I write this. 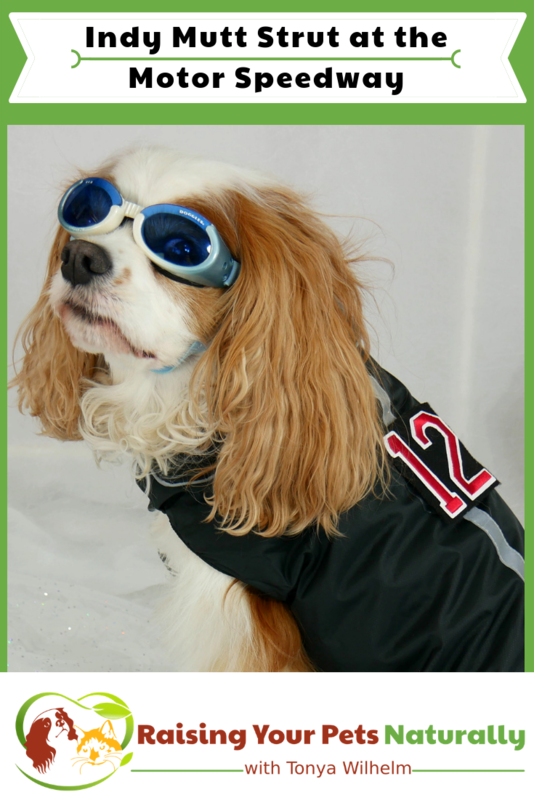 I have wanted to take Dexter to the IndyHumane’s Mutt Strut ever since I saw my Cavalier friend Elvis walk the track four years ago. This April, we will be visiting Carmel, Indiana, just north of Indianapolis. I will be crossing this dog event off my personal bucket list during our weekend stay in Hamilton County! 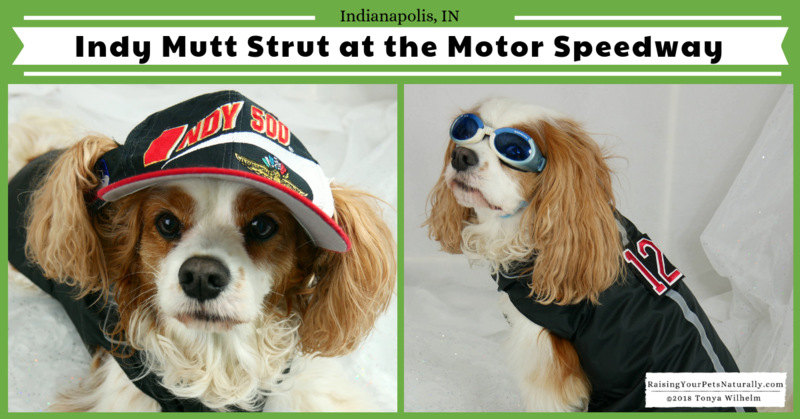 The Mutt Strut will be held on the Motor Speedway on April 27, 2019. As a household who loves Indy car racing, this is a big deal for us. 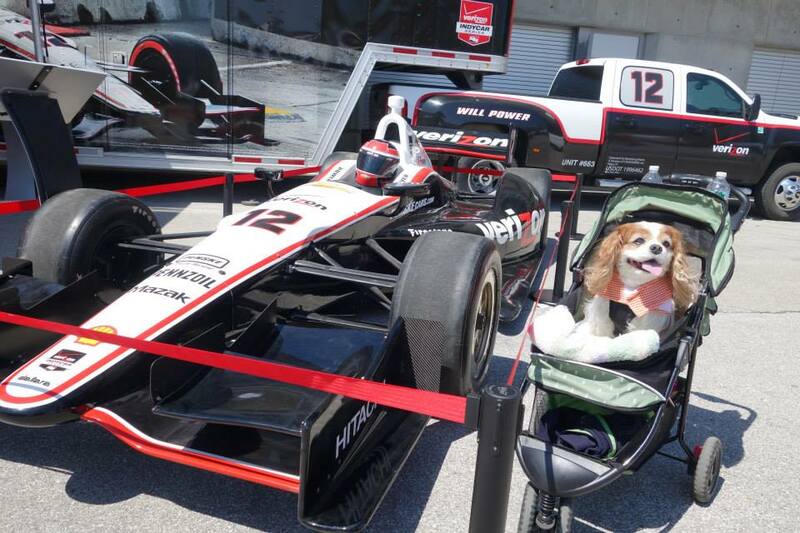 We, including Dexter, will be walking the historic Indianapolis Motor Speedway track and even have the chance to kiss the bricks, all while supporting IndyHumane. The Mutt Strut isn’t just open to dogs, but other animals as well. It is advisable to ensure the pets are comfortable in a large crowd, as the event typically draws 3-4,000 people and pets each year. Some pets would do best in a carrier, pet wagon, or covered stroller. Hoofed animals wearing rubber-soled shoes for the entire day are permitted to participate. The Gran Prix course is 2.5 miles long. However, there is a shorter route that is just over a mile in length. 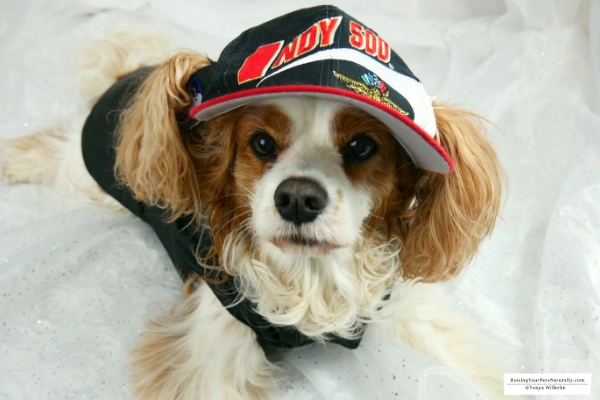 This allows pets and people of all abilities the opportunity to participate. And you’d better believe that Dexter will be utilizing his dog stroller and a good pair of dog boots. I have heard that the track can warm and be a bit rough on pads. During the event there will be plenty of food trucks and vendors to sniff out. Or, if you wish, you can pack a lunch for you and your pooch. The most important thing to pack is a good attitude, and be ready for a howling good time. 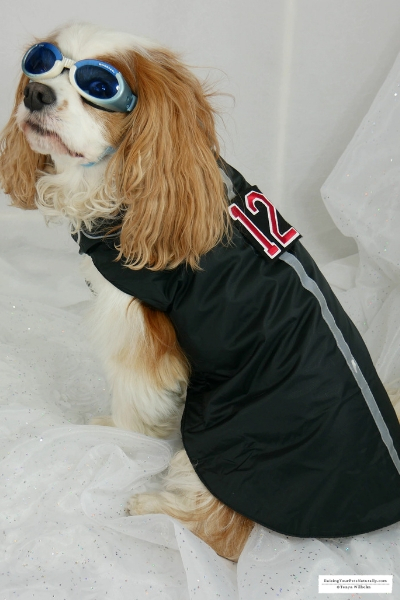 Dexter is ready with his dog racing jacket with his favorite number, 12, for Mr. Will Power. You can register online as an individual, or you can join a team. 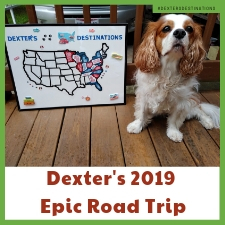 Dexter and I would love for you to join our team! You can do that here. 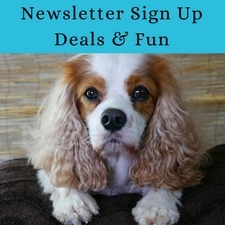 If you cannot join in person, don’t worry, you can still join and support IndyHumane virtually. 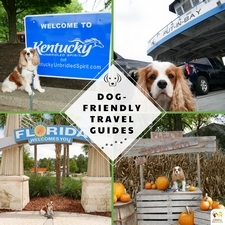 I’ve teamed up with Hamilton County Tourism, Inc. to offer my readers the opportunity to explore Carmel, Indiana with their dogs. Enter today for your chance to win a complimentary stay at Staybridge Suites in Carmel along with some other great prizes. $10 to Books and Brews in Carmel – dog-friendly patio. Located just north of Indianapolis, Hamilton County, Indiana, offers a unique set of attractions, special events and affordable accommodations in Carmel, Fishers, Noblesville and Westfield. With the finest in authentic downtowns, Hoosier hospitality and easy access to I-69 and I-465, you’ve got a fun, affordable destination that’s closer than you think! I do hope to see you and Rex at the event! It’s going to be so much fun. Go Team Dexter! What a fun road trip! It would be neat to see a grand prix in person. I like his dog jacket too! Me too! Super excited. Thank you. I think it turned out pretty good. Such a great dog friendly event. I can imagine how happy the dogs are when there. It’s so nice to see dogs out and about having a good time. 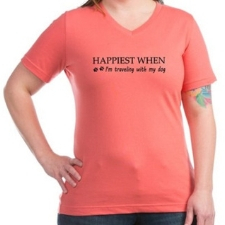 Especially when it supports a great cause. I had no idea this event even existed! So fun. Glad to share. I am so excited to attend! Now this sounds like such a fun road trip, those googles are absolutely adoreable as well. Sally has been suffering with the sun since her eyesight started to go and I’ve been thinking about getting some with a tint for her. That is one cool dog. I love that he enjoys traveling with you and those goggles. Thank you! 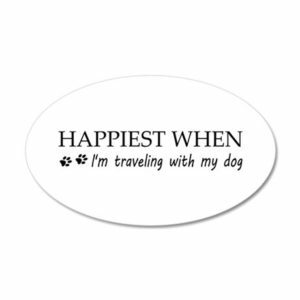 Traveling together is one of our favorite things in life. Yes, is Doggles rock! The Mutt Strut at the Motor Speedway is so unique. We are so excited to go! CUTE ATTACK!!! The pictures are adorable, thank you so much for sharing. Thanks Chad! Dexter can be quite the charmer. That is such a very lovely dog. I love it when I hear happenings similar to this. Pet and owners get to bond happily together. Thank you. I love seeing people do things with their pets too. It’s such a great bonding experience. 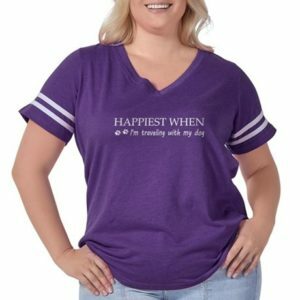 This must be a great trip for all of you guys. Your dog is so adorable. Thanks for sharing. Thank you, Ophelia. We love spending time together on the road. I’m so jealous that your pup will wear accessories! We tried to put them on our puppy and she just shakes. Dexter looks so great in that Indi hat and jacket! Anyway, that giveaway is amazing! The dog-friendly stay has to be my favorite. Thank, you, Dalene. It’s a pretty good prize pack! Hamilton County is one of my favorite places ever! We always visit and seems there is always something new to check out! Thanks, Cheryl. It will be a new and fun adventure for us. I can’t wait! Looks like really fun event. It really makes me happy seeing activies like this. The owners and the pet will enjoy it. I am looking forward for next year. 🙂 I love being able to attend such great fundraisers. They are so much fun and so important. I love pet friendly places and events! My heart is so happy! Wow this looks like so much fun! What a perfect thing to do with your pets! I think it’s going to be a blast! What a fun road trip! It’s great that so many attractions are opening up to dogs and their owners. Your dog is so cool! I love the way you dress him! Even cooler: places made for dog lovers and their pets. Thanks for sharing! Thanks, Enriqueta. He likes showing off his style! This sounds like such a fun road trip. Great time out with the puppies 😀 Thanks for sharing! Happy to share. I can’t wait to go! Oh my, this event looks and sounds amazing. Hats off to the person or people who came up with this idea. I love Dexter’s racing jacket as well. Thanks! I can’t wait to go! Only a few more weeks!